In its 43rd year, main stage headliners include Cardi B, Dave Matthews Band, The Killers and Shinedown. 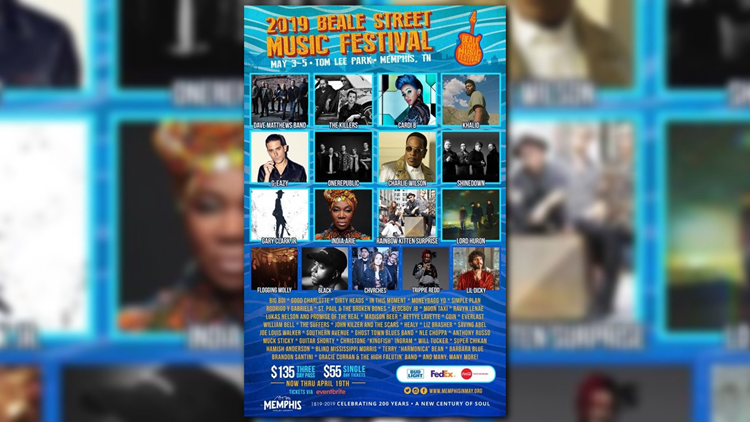 MEMPHIS, Tenn. — The official Memphis in May Beale Street Music Festival lineup was released this week. The kick-off event to the annual month-long Memphis in May Festival, the Beale Street Music Festival is held in picturesque Tom Lee Park, a river bluff park overlooking the Mississippi River in downtown, Memphis, TN, at the foot of historic Beale Street. Long known for its diverse line-up of top music stars both old and new, the annual event features 60+ artists on four stages over its three-day run. According to the Eventbrite, this event will take place rain or shine. Three-day passes are $135 per person, single day tickets are $55 per person now through April 19. For more information about tickets, click here. The festival opens to the public at 5 p.m. on Friday, May 3 and runs through Sunday, May 5. Big Boi * Good Charlotte * Dirty Heads * In This Moment * Moneybagg Yo * Simple Plan * Rodrigo Y Gabriela & St. Paul & The Broken Bones * Blocboy JB * Moon Taxi * Ravyn Lenae * Lukas Nelson and Promise of the Real * Madison Beer * Bettye Lavette * Coin * Everlast * William Bell * The Suffers * John Kilzer and the Scars * Healy * Liz Brasher * Saving Abel * Joe Louis Walker * Southern Avenue * Ghost Town Blues Band * NLE Choppa * Anthony Russo * Muck Sticky * Guitar Shorty * Christone "Kingfish" Ingram * Will Tucker * Super Chikan * Hamish Anderson * Blind Mississippi Morris * Terry "Harmonica" Bean * Barbara Blue * Brandon Santini * Grace Curran & The High Falutin' Band * And many, many more!